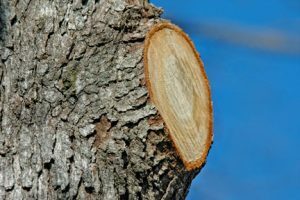 One of the primary reasons to prune tree limbs is to open the canopy of your landscape, allowing more sunlight to reach the grass and low growing shrubs. It also makes for a more balanced, aesthetically pleasing look. However, there is a right and wrong way to prune those limbs. When done right, trees quickly recover but the wrong cut can create a snowball affect of negative consequences. I suggest a three-step approach to pruning tree limbs. Make the first cut about one or two feet out from the tree trunk. This cut starts on the underside of the limb and goes into it, but only about half way. This is a very important step in the process. The second cut is out beyond the first cut another foot or two. This cut goes down and all the way through the branch. The branch is likely to break away as you make your way through the limb. Because you’ve already made the first cut, the bark will not continue to tear down into the tree trunk. Without the first cut, as the branch breaks away from the weight of the limb, any remaining parts of the tree (the attached and uncut bark) goes with it, tearing the bark from the tree as well. This creates a big potential problem, allowing a large open wound and entry point for pests and diseases. The final cut is right at the branch collar where the branch meets the trunk. You’ll notice a flared area here. Make the final cut so that the flair is just evident. If cut properly, this flair will heal over and eventually fill in with new bark or scar tissue. You’ll know the tree is healing properly when you notice what looks like a doughnut forming where you made the cut. The best time to remove tree limbs is in late fall through late winter (during its dormant season). Disease pathogens are inactive and therefore not a serious risk to damaging your trees. However, a fresh cut or wound during the warmer months can be an easy entry point for diseases and pests. Be aware that there are some trees that “bleed” excessively when cut. This is sap oozing from the fresh cut. Although it looks serious and unsightly, it causes no harm. Some trees that are especially prone to bleeding include beech, birch, elm, maple and yellowwood. You may be inclined to dress fresh cuts or wounds with tree paint or wound dressing, sold and marketed as such. My suggestion is that it is rarely necessary and most of the time actually slows down the natural healing process. Trees are amazing at adapting to adverse conditions so my advice is to make a clean cut and leave it alone. Pruning tree limbs can be a great improvement to the look and health of your total landscape if you follow the guidelines mentioned above. Taking shortcuts or pruning at the wrong time can lead to more problems later. Hi Joe…so my question is…I have a 10 to 15 foot tall young popular that I planted last year and my dog got into it and damaged the tree… Now from about 2 feet up the tree is completely dead but looks healthy from there down. What is the best way to prune the tree so it will grow decently? I suggest you take a photo of the tree and contact your local cooperative extension service or arborist. If it is a single trunk and you top it, you will likely not like the way it looks. Is it a tulip poplar, Liriodendron tulipifera? Before you do any pruning, scratch the bark and make sure it is not green under the brown. Be patient and keep it watered. Best of luck. main trunk. Several questions. Do you recommend cutting to a single trunk? Can I do it or should we hire an arborist? Your advice will be much appreciated. Thank you. Hi Bob. There is some fact to that risk of one of those 2 trucks eventually breaking away and at least competing with each other along the way. But it might be that they are never an issue. I have quite a few trees on my property that I inherited with co-dominant trunks. I’ve opted to leave them alone. Perhaps this is not best-practices but they’re not at risk of hurting anything and they are quite solid. If you decide to take one out, I would cut it at a slight angle to avoid standing water on it. And I don’t know all the circumstances regarding your limitations or hazards of it hitting anything if you were to cut this down yourself. Personally, I would do it myself unless there was a strong reason not to. Joe, for a plum tree we have, a tree guy that stopped by to appraise removal of another tree observed that our plum tree had many lower branches that were somewhat weeping (i.e. hanging/growing less than horizontal). He said that those branches are stressing the tree and should be pruned. Was that accurate and trustworthy? Hey Scott. I have my doubts about low hanging branches stressing the tree. I’ve never heard of this and don’t see the science behind this rationale. I think your instincts were good. However, I often cut downward growing limbs if they are either in the way, or visually unappealing to the overall balance or aesthetics of the form. But I’ve never cut them to improve the overall health of the tree just because they were somewhat weeping. If there were an abundance of fruit on branches, then removing some of the fruit would help, or if the branches were diseased, damaged, or crossing others, than yes, they are candidates for removal. Otherwise, no, not unless you have a reason to remove them. Joe, Now I’m confused. You said in your newsletter that spring is the best time to prune, but this article says to prune in the Fall. Which one is best?? Hi Judy. Fair enough. I added (during its season of dormancy) to the article that led to your confusion. They key is to do your major pruning during dormancy. So late fall should cover that in most cases. I like to do my pruning between mid-Feb and mid-March in my area. And to clarify, don’t wait till mid-spring to do it either. Mid winter to early spring would be best (before new growth starts emerging). Hope that helps.